I just got back from a few crazy days at Mardi Gras in New Orleans. The beads, the liquor, the parades – it leaves your head spinning and your liver begging for mercy. But, beyond the drunken fun, is a very sad reality: the homeless population in New Orleans. And, for someone like me, it would be impossible to NOT notice that just about every other homeless person we saw had a dog. A decade ago, maybe even just 5 years ago, I would have been completely distraught by the number of homeless people sharing their homeless lives with a dog. I would have wanted to take the dogs away and find them homes – find them “better” lives, assuming that a roof equals a better life. A couple years ago, I did story on a group called Pets of the Homeless. I learned a lot from them, mostly, the important fact that homeless people love their pets as much as I do. Homeless people almost always go without food, so their pets can eat first. Losing their pet is just as devastating to them as it would be for me. They are homeless, not heartless. 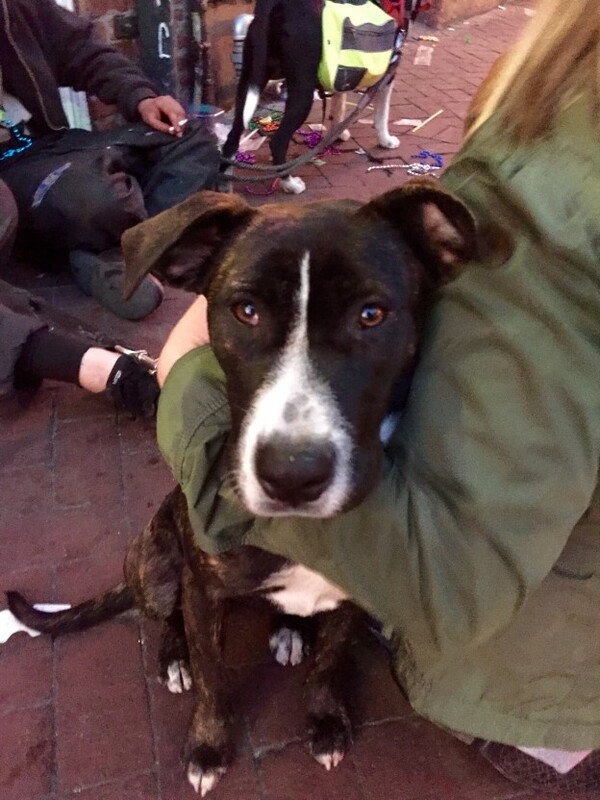 During Mardis Gras, it was my friends who gasped at the idea of allowing dogs to stay with homeless people. They couldn’t believe I made peace with it. I pointed out what great shape the dogs were in. None of them looked the slightest bit hungry. Their coats were shiny and well-kept. Their tails wagged. Some even had sweaters to keep them warm. Above all else, I could see love and loyalty in the dogs’ and the humans’ eyes as they sat together. What really allows me to make peace with this situation is the harsh reality of shelters across America. Over one million dogs will die this year simply because of a lack of space. As I looked at the dogs sitting in the laps of people who loved them, I also could see the thousands of pictures of dogs in dire need I get every day on Facebook or twitter or thru my own email. Thousands of dogs who will die alone in shelters. Each one of them a victim of a human being – a human being who probably had a roof over his or her head. Homeless people spend every minute with their dogs. They feed them and love them. What more could I want for a dog? Certainly, that is a far better alternative to euthanasia in a shelter. I looked at the dog cuddled tight in his owner’s arms and I thought of the dog alone on death row, days away from being killed. There is zero doubt in my mind which situation is better. I did notice many of the dogs weren’t neutered. In fact, I even talked to a few New Orleans policemen about it. They weren’t experts, but they both felt that the SPCA would spay and neuter the dogs, it was more likely the owners weren’t willing to let the dogs go. I am sure they fear never getting them back. I can’t lie- the images of the people and their dogs haunt me. I am always trying to understand how someone’s life can come to that. I also wonder how, as a society, we accept something that seems so fundamentally unAmerican. Statistics show that thousands of homeless people are military veterans – an even sadder state of America. I, by no means, have solutions for such complex and overwhelming social issues. However, I do strongly believe that homeless people should be allowed to keep their dogs. And while I think we need to always work towards being more compassionate, I don’t think we need to feel such pity for the dogs. Truthfully, most of the dogs living with the homeless population have it far better than the million dogs left to die in shelters. Taken even one step further, many of the dogs living with their homeless families are given more love and attention than many of the dogs living in middle class suburbia. This entry was posted in Uncategorized and tagged animal shelter, euthanasia, homeless, no kill on February 9, 2016 by sheltertails5839.